Here are the predicted Europa League lineups for this week’s most important matches. Every Europa League team will be presented with its predicted lineup, according to the formation chosen by each team manager. This season, Europa League 2018/19 is more interesting than ever. 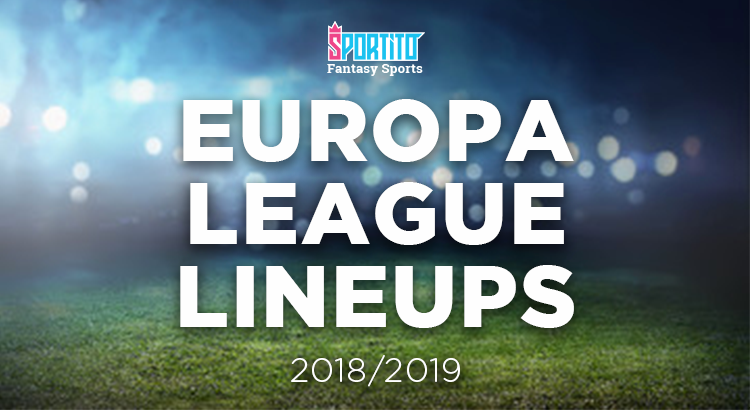 This will help you in drafting the fantasy Europa League teams on Sportito. We will update this article for every Europa League match, so make sure you visit us every week to check them out. Good luck with your Europa League fantasy football teams! Napoli (4-4-2): Meret; Hysaj, Abiol, Koulibaly, Mario Rui; Callejon, Fabian Ruiz, Allan, Zielinski; Insigne, Milik. Arsenal (3-4-1-2): Cech; Papastathopoulos, Koscielny, Monreal; Maitland-Niles, Xhaka, Ramsey, Kolosinac; Ozil; Lacazette, Aubameyang. Eintracht (3-1-4-2): Trapp; Abraham, Hasebe, Hinteregger; De Guzman; da Costa, Fernandes, Rode, Kostic; Jovic, Rebic. Slavia Prague (4-3-1-2): Kolar; Coufal, Ngadjui, Deli, Boril; Sevcik, Kral, Traoré; Stoch; Masopust, Olayinka. Villarreal (4-2-3-1): Fernandez; Gaspar, Gonzalez, Ruiz, Quintilla; Caseres, Cazorla; Ekambi, Iborra, Fornals; Bacca.